the Goodman Piece was lost forever). During the voyage they berthed at Halifax, Nova Scotia, where Britten came across a book of medieval poems and some of these he set during the voyage as the 'Ceremony of Carols'. It is an unusual setting in eleven movements for upper voices and harp; for this performance the girls were joined once again by the fabulously talented local harpist Rowena Bass, who also performed a mesmerising solo item, Watching the Wheat by John Thomas. 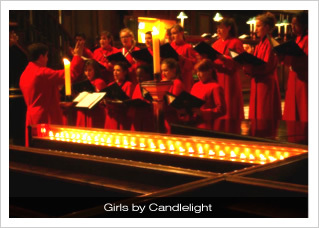 The girls were accompanied by the Director of Music on the piano for two very different settings of the New Year Carol, a text which was included by Walter de la Mare in his anthology of poems for children, Tom Tiddler’s Ground (1931). Despite both writing for the same forces, Britten and Howells could not have set this puzzling text more differently. Where Britten chooses a gently wandering depiction of the ‘new water from the well’, Howells produces an infectious romp to ‘let the New Year in’. Finally, the girls were joined by the Choral Scholars, Lay Clerks, and the Organist Roger Palmer for a few broader settings, including Howells’ rarely heard and richly chromatic Tryste Noël, dedicated to Sir David Willcocks and John Rutter. 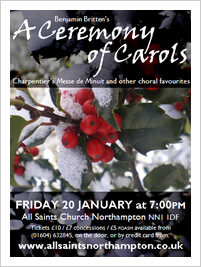 The concert concluded with movements from Charpentier’s invigorating Messe de Minuit pour noël, last heard at All Saints at Midnight Mass on Christmas Eve. The concert finished just as the candles were beginning to flicker and fade, and so the Christmas music was packed away for another year.